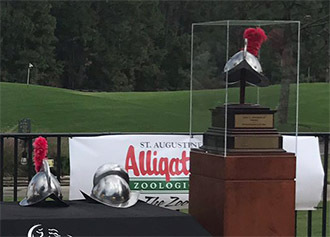 ST. AUGUSTINE, FL (October 15, 2017) - Giulio Castagnara shot a four-under 66, the low round of the tournament, to come from behind and win the 14th St. Augustine Amateur at St. Johns Golf Club. Castagnara, an Italian who recently completed his college career at Texas Christian University (TCU), started the day four shots behind Michael Saccente (Edgewater, FL), who had led the tournament after each of the first two rounds. Saccente, a redshirt freshman at the University of North Florida, saw his lead immediately grow to five shots as both Castagnara and Rasmey Kong (W. Palm Beach, FL), also four shots back entering the round, lost shots early on. In fact, Castagnara fell six behind after bogeying the first two holes, and looked to have little chance to get back into contention. But he flipped the switch at the very next hole, making birdie at the short par four, and then another at the par-four 4th, beginning a stretch that would see him go six under over his next nine holes. Saccente started out steadily, parring the first five holes, and still had a four shot lead when he bogeyed the par-four sixth. Castagnara followed with a birdie on the next hole, and suddenly the lead was two. Another birdie on the par-five 9th cut the lead to one. Two holes and two birdies later, it was Castagnara on top at five under for the tournament, with Saccente one behind. Kong, who at one point was six shots back, was making a move as well, making four birdies in six holes starting at the 7th, to climb back into contention at three under, two shots behind Castagnara and one behind Saccente. A crucial two-shot swing at the long par-three 15th, with Kong making birdie, while both of his opponents making bogey, shook up the leaderboard and put Kong on top tied with Castagnara, with Saccente now in third one shot back. The tie was short-lived though, as Castagnara birdied the next hole, the par-five 16th, to go back one up, before Saccente picked up a shot on the two others with a par on the long par-three 17th. On the 18th tee, Castagnara was four under, one shot ahead of Kong and Saccente. With his opponents looking for the birdie to send the tournament to a playoff, instead it was Castagnara who found the green, rolled in a birdie putt, and slammed the door on what had become a wide-open and entertaining battle on the back nine. Though Castagnara has had several high finishes, competing in Europe and South Africa as well as playing college golf at TCU (he finished 5th in the NCAA West Regional two years ago), this is his biggest win in amateur golf so far. It was a disappointing finish for Saccente, who didn't make many mistakes but couldn't really get anything going either. He only had two bogeys on the day, fewer than either of his opponents, but didn't make a single birdie on the day in a closing 72. Kong finished with a 68 to finish in the tie for second with Saccente. Cody Carroll (Jacksonville, FL), a University of North Florida commit, tied for the low round of the tournament with a 66 to move into solo fourth at two under. 17-year-old David Morgan (Naples, FL) closed with a 68 to finish fifth at even par. Jeff Golden, a 32-year-old from Jacksonville, won the award for the low mid-amateur. Golden shot a 71 on Sunday to finish tied for 19th at nine over par.